A stake center is a church meetinghouse or church where the offices for a Stake are located. Similar in size to most other meetinghouses, the stake center is the location where, in addition to normal church services, stake meetings are held. A stake center building usually includes a large chapel, with overflow space into a "cultural hall." The cultural hall is a multipurpose area with a finished wood floor and retractable basketball standards. 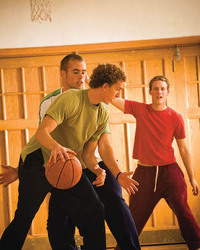 It can be used for basketball games, which are frequent between wards, dances, gatherings, and celebrations. Members are often allowed to schedule and use the building for noncommercial purposes such as funerals and wedding receptions. Stake centers sometimes have stages for dramatic productions, which often are part of holiday celebrations, or youth activities. There is a large kitchen, classrooms, a materials center (library), a special room for the Primary, a nursery, a room for the Relief Society, a baptismal font, dressing rooms and rest rooms. There are offices for ward and stake leaders, and sometimes a Family History Center. Generally speaking the kitchen, referred to as a "serving area," is not intended for food preparation or cooking unless it is part of a lesson, demonstration, or other instruction. "When food is to be served in the building or on the grounds, it should be prepared elsewhere and brought to the meetinghouse, where it may be kept warm or cold until it is served." To know what to expect when visiting a Mormon meetinghouse, click here. This page was last edited on 17 June 2018, at 23:47.